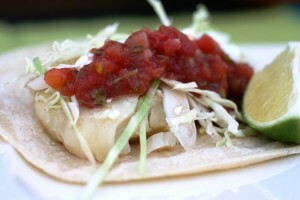 We love fish tacos, well we really love anything Mexican inspired! 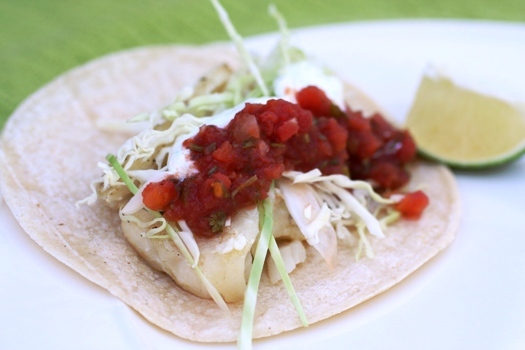 Fish tacos are so fresh and light, and this recipe is very easy. My favorite thing about any Fish Taco Recipe is that you can use your favorite toppings or utilize refrigerator leftovers to fill the tortilla. Making Fish Tacos is a good time to also make Grilled Chili Lime Corn. They pair nicely together AND you already have the grill going. To finish off the dish, I get a can of black beans going on the stove and pep them up a bit to make my Spicy Black Beans. This dish started as all part of my quest to use the rest of the cabbage in our CSA. If you are looking for more ways to use cabbage, be sure to checkout my Cabbage Recipe Round-Up as part of my weekly Ingredient Exchange series. Since my fish usually falls apart on the grill, I prefer to cook the fish in an aluminum pan on the grill versus directly on the grill. I keep a stash of these under the grill, in the door, when I have extra pans from meals we have cooked. Lots of lime juice. That is the key. And finally, steaming corn tortillas, they taste much better and lighter than their flour counterpart. Heat up grill. 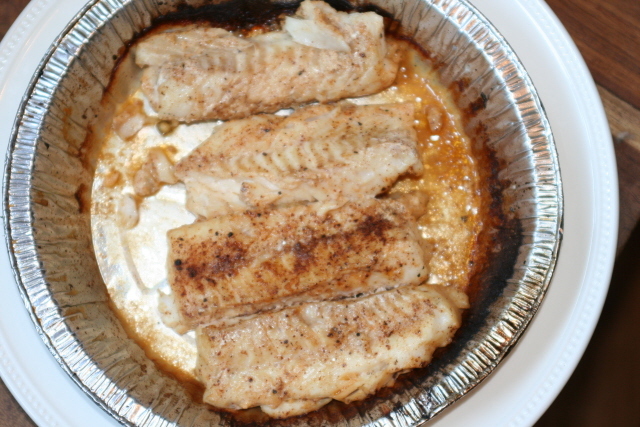 While grill is pre-heating, place fish in an aluminum pan, coat with olive oil, lime juice, and spices. Transfer to grill, and cook the fish in the pan for about 3-5 minutes or until cooked through. Combine sour cream, lime zest and juice in a small bowl and set aside. Heat corn tortillas in microwave for about 15 seconds, double them up and fill with fish, cabbage, lime crema, onions and salsa. RED CABBAGE SLAW: Marinate cabbage in 1/3 c. Lime juice, 2T honey, 1T oil, 1t ground cumin. CHIPOTLE MAYO: 1/2 c Mayo, 2 chilies, 1T adobe sauce (from chilies), 1/4 t salt, 1/8t cayenne pepper. Tracy – I love those ideas! Might need to make some this week now!